Alphaxone (Iran) & ProtoU (Ukraine) join forces on Space Ambient album Stardust. Float weightless in the void to the sound of exploding supernovas. A solid thump closes the airlock behind you. Greeting your vision, a myriad of stars shining like beacons in black space. Rapid fingers across the uplink to the mothership "Feed my cat while I'm gone". The engine roars as the plasma ions accelerate. The mothership but a pixel left behind. Your ship's humming soothes your excitement as you set out for new unexplored worlds. Alphaxone’s spacey synthesizers sweep in and out of ProtoUs iconic filtered noise on this unique release. Recommended for lovers of space ambient and old school science fiction soundtracks. Space Ambient, or Sci-Fi Ambient, is a particular variety of sound that, to a tired mind, can end up being a gateway to long-ranging mental vacations, to places so far away that the air-miles collected would probably be enough to buy this planet. 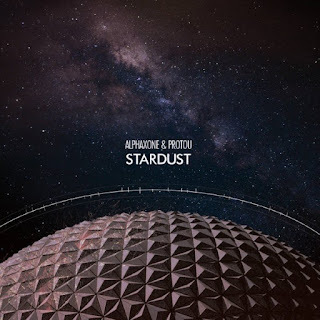 Alphaxone and ProtoU’s Stardust is one such album, a collection of seven tracks that entices the listener with the smooth quietude and uproarious activity that might be experienced in the deep heart of the universe. The opening track is Consumed, a composition that opens with the grainy sound of what just might be teeny tiny rock particles fizzing as they hit the metal of a vast starship, the rumble of its engines and the creaking of its structure beckoned on by a gentle, almost Om-like sound, as it plunges deeper into the void. The sounds of rumbling bass and electronic warbles set up a soundscape of activity but indifference, a lonely space, the sounds of broken transmissions only serving to heighten this effect. It ends more warmly however, as birdsong creeps into the soundscape. The next track is Planemo Dreams, and this track is a whole different environment. Dripping water and rain is very much the order of the day, but it’s accompanied by the roar of what might be a malfunctioning artificial intelligence, at least to my own warped mind. Circuits hiss and sputter as water droplets run down unresponsive screens, their glowing icons slowly growing dim. A gently throbbing drone with subdued plucked strings and high, flute-like notes adds other interesting touches to a more organic, but still seemingly uncomfortable soundscape. Up next is Observing Quasars. A leisurely bass pulse twins with a swelling and fading higher tone to hint at vast distances swallowing both time and matter. Lighter tones accompany what could be the sunrises and sunsets on a billion unknown planets, a fiery dance in the dark blanket of space, spitting out sparks of energy in all directions. Versus emerges next, a track that begins with birdsong and a looming drone. Burbling sounds of machineryesque sound is punctuated by a lone chime. A swell of horn. Another chime. A whisper-like sound with footsteps. A vocal-like cry seems to herald a new dawn, almost sounding like a distant steam-engine might. Around the midpoint, an electronic beeping becomes the focus, a chant-like grumbley backing drone hinting at technological happenings. The track ends with a deepening drone and a whitenoisey hiss. Sub Signal features a low drone, delicate electronic tones, undulating vibrations and hums. It grows in intensity. Smooth electro-crackling echoes down empty corridors, probing and testing them. 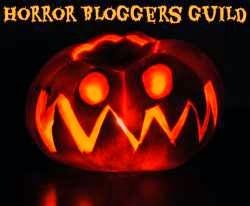 There is also a hollow sound, a bit like what might be made by blowing down a glass tube. Remnants of a transmission mumble near the end, beeps and chirps sounding insect- and bird-like as things begin to fade. Alignments is the penultimate track and brings with it a kind of distorted buffeting that could definitely sound like gigantic thrusters manoeuvring things into position. Electronic notes seem to rotate and confirm paths... the whole track seems to have an 80’s sci-fi kind of flavour, a kind of bouncing electronica that is fun to listen to. The final track is Returned. A deep rumbling begins proceedings, small detail sounds adding other areas of interest. A staticy-drone serves as a popping backdrop, like bubbles bursting in a bubble bath. A growing, high-pitched whine sets the scene for a lighter drone to emerge, a claxen/signal sounds, the hum of engines, and a sound that verges between a modem handshake and a baby’s cry. Stardust is a dark dose of rumbling sci-fi that manages to mix the ingredients of both void-like drones and more nature-based field recordings in a way that seems to work very well. 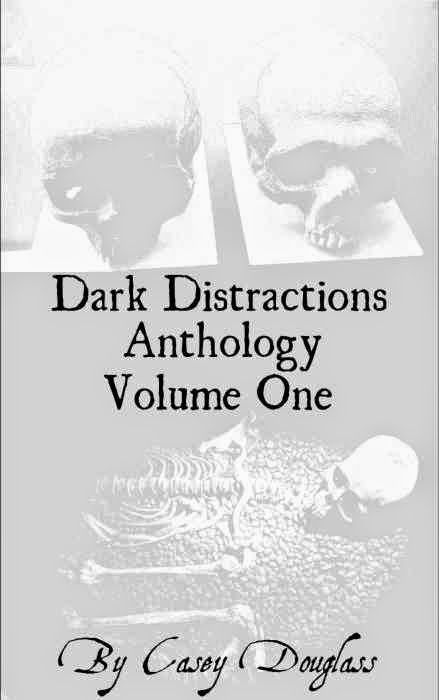 I often like to create my own narratives when listening to a dark ambient album, and the only issue this mixture of sounds caused was a kind of mental disconnect from my own personal imaginings. I am sure that with time, I would come up with appropriate mental imagery that makes sense of the majority of what is going on in each soundscape, but in the mean time, that is certainly nothing to hold against this collection of rich ambient tracks. If you want to check out some very good space ambient, turn out the lights, kick back with a good pair of headphones and sprinkle some Stardust on proceedings. Visit the Stardust page on Bandcamp here for more information. You can check out Observing Quasars below too.